November 19, 2018, 6:00 p.m.
For all its technological marvel, the ubiquity of mobile phones has had deadly consequences. Cell phones have become so popular over the years that many find it hard to put them down, even while driving. According to the CDC, nine lives are lost to crashes involving a distracted driver every day. 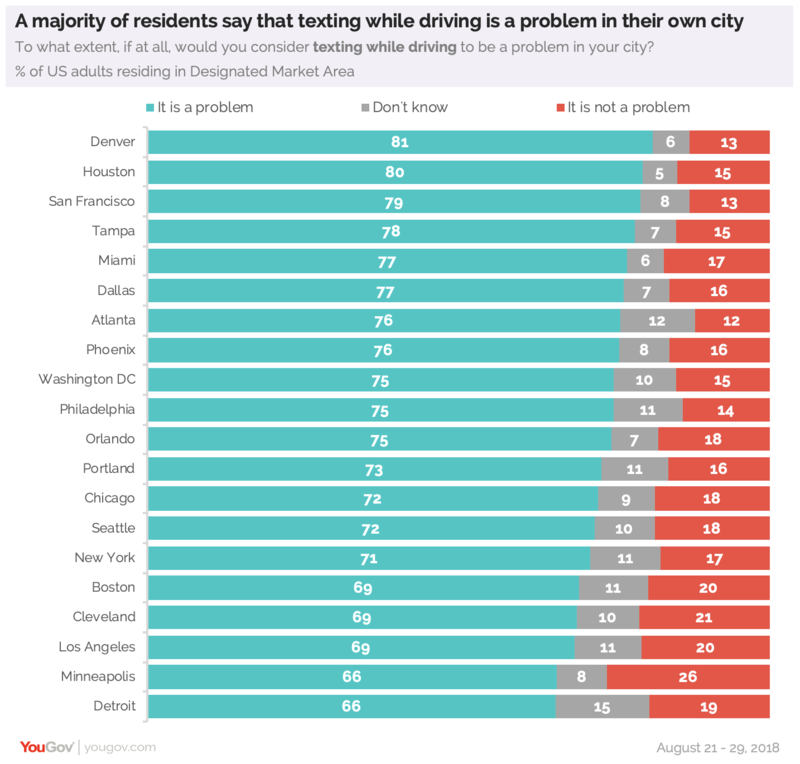 A recent YouGov Omnibus poll finds that a majority of city residents across the US report texting while driving as a problem in their respective cities. Distracted driving appears to be a widespread problem. Leading this national epidemic is Denver (81%) and Houston (80%), where eight in ten residents say that texting while driving is a problem. Even in cities like Detroit and Minneapolis, where residents are less likely to view texting while driving as a problem, two in three (66%) residents report that it is either ‘somewhat of’ or a ‘serious’ problem. And it’s not just drivers who are plagued by texting distractions. 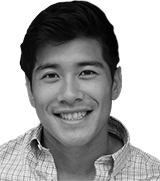 Distracted pedestrians also add to the problem especially in cities such as New York, San Francisco, Miami and LA. More than half of residents in these cities say texting while walking is a serious problem. 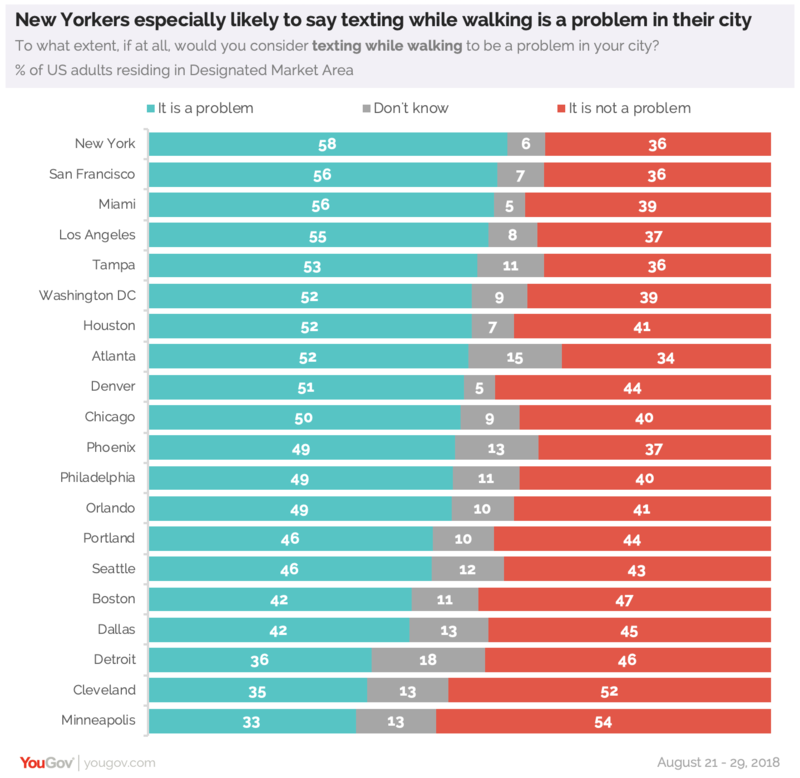 Minneapolis again appears at the bottom of the list and, along with Cleveland, are the only two cities where a majority of residents don’t view texting while walking as a problem.